I remember sitting under my home pastor in Kingsport, TN, Rev. Bobby Russell, and listening to him in the mid and late 80's preach with conviction on things that at the time made no sense to me. One of those things was, as he put it, the "name it and claim it" preachers. Rev. Bobby Russell was concerned at "those guys on television" who were making the argument that if we name something we want in Christ, then we are to just claim that thing in Christ and He will deliver it to us. This drove him nuts. 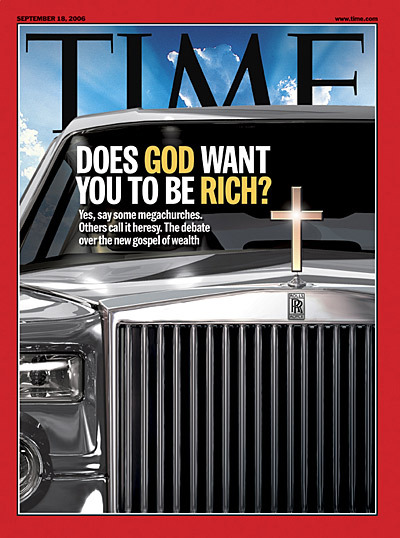 So, I notice on the cover of Time Magazine the cover story "Does God Want You To Be Rich?" Pastor Russell's concerns were correct, this misconstrued ideological methodology has found a home in mainstream Christianity, especially prominent in some of the larger, megachurches out there. I have personally dealt with this recently with very good meaning Christian leaders who have simply absorbed this mindset without realizing its potential damage. Not long ago I attended a function where a 16 year old was being praised for his "claiming" a Nissan 350 Z at an earlier age and then "keeping his faith up" in order to receive that car. Obviously, we were there in honor of his receiving the car when he turned 16, apparently because he had named it and claimed it. Without hurting the feelings of the very good intentioned youth worker, I subtly spent the next few weeks teaching the teenagers the reality of the Prosperity Gospel, and what it leaves out of the true Gospel. You see, its not that everything this philosophy teaches is wrong. Some of it is, but what makes it completely off base is what it leaves out. My wife is taking courses toward a certificate of study at Southern Seminary that stresses the family, the husband and wife relationship, and what it means to be a pastor's wife. Last week in her course material, one of the quotes she was memorizing for her class is that as a couple, we are to "remember the cross together and die daily." She was at first kind of weirded out by that, but I felt a deep connection with it. The Gospel of Jesus Christ is a tough message. Prepare yourselves for suffering, ridicule, stress, anxiety, fear, confusion and days of just wanting to give up. Without a daily dying to self, a person cannot withstand those elements for very long. The prosperity gospel would never dare preach a message of dying. That is why we have more and more lifeless, selfish, pointless Christians in the pews than ever before. Mark chapter 13 is an eye opener. The disciples, in their perpetual confusion, ask Jesus about the destruction of the temple he had just prophesied, the end of history and their own apparent forth coming ministry. Listen to the words of Christ from Mark 13: "You must be on your guard. You will be handed over to the local councils and flogged in the synagogues. On account of me you will stand before governors and kings as witnesses to them. 10. And the gospel must first be preached to all nations. 11. Whenever you are arrested and brought to trial, do not worry beforehand about what to say. Just say whatever is given you at the time, for it is not you speaking, but the Holy Spirit. 12"Brother will betray brother to death, and a father his child. Children will rebel against their parents and have them put to death. 13All men will hate you because of me, but he who stands firm to the end will be saved. That's positive stuff don't you think? Be prepared to be flogged in the synagogues! All men will hate you, you will be arrested, etc. And, of course after reading the book of Acts and other historical works, we know that the disciples experienced exactly those things in the days ahead. Finally, my last example is Mark 10, the story of the rich young ruler. What makes this account of Jesus so remarkable is not that Jesus asked him to sell all his possessions, but the stark contrast between this particular teaching of Christ and the OT. An OT understanding of being rich was that of being deeply blessed by God. Being rich was seen as God's favor on you. Christ brings the counter to that message of prosperity. It's not the wealth of the man that finds favor with God, but instead it is that very wealth that is preventing him from even having a relationship with God. Obviously Christ didn't expect everyone to sell everything they had in order to follow Him, or He would have said that to every person He came in contact with. Trust me, I do not take a vow of poverty and live as a monk. I enjoy being able to experience things that require money. But here He finds a man who the Bible says Christ loved (which is interesting) but Christ knew that the money was just getting in the way. So why go through all the dying, suffering and heartache that the Gospel requires? Because the story doesn't end there. The same God has promised joy, contentment, blessing and eternal life. This same God has promised not to forsake us or leave us, He will not forget. And this same God has promised us sustaining and sufficiency. I'm tempted to think there's a direct correlation between the size of a church and the degree to which it has perverted, compromised or watered down the gospel message. What do you think? Thanks for reading and responding. As with anything else, we have to be careful when stereotyping a church, denomination, a people group, etc, universally across the board. I do agree with you that most of the megachurches that receive media attention and are broadcast weekly on television have a diluted Gospel presenation, but I would not say that the rule without exception is Big Church=Weak Gospel. As usual an excellent post. It seems helpful to me to liken the synagogue (for those earliest Christians) to the church - the gathering place for believers. As such we too might find ourselves flogged -- though figuratively!-- in the church. Your blog just keeps getting better. Keep it up. Man was created for the glory of God, to bring glory to Him, to praise Him. Sin focuses on self and bringing gloriy to self, which is manifest in one way by materialism, i.e., "having stuff" that the sinful self sees as making it look good; we decorate our "selfs" with "stuff". Our materialistic culture/society teaches us in a thousand ways each day via TV, magazines, advertising, etc., and is modeled by the examples of our parents, our leaders and our "heroes" that this is desirable, a goal worthy of spending our lives to achieve. Christ's warning that we cannot serve two masters is the death knell for the teachings of those who promote the prosperity/"name it and claim it" Christianity. 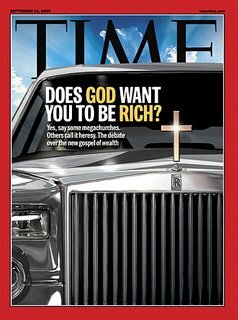 The wealthy men of the Old Testament were so blessed because their God knew they could be trusted not to worship that wealth. He knows the heart that He can entrust with wealth, those who will use it to His glory, not their own. For for those few Old Testament saints, wealth was not the distraction that it is for most of us. Even today God has entrusted with great wealth godly men and women who He knows will use it in His service and to His glory. Money is not evil, just the love of it. And this may sound a bit crazy to those who desire great wealth, but I know that my God knows and loves me, and He knows that I could not handle great wealth, that it would mean certain ruin for me. So I am grateful that in His wisdom and love for me He provides for my needs without fail, but protects me by not providing me with an excess of wealth. Agur, son of Jakeh, expressed my sentiments in this matter perfectly in Proverbs 30:8,9. ". . . give me neither poverty nor riches, but give me only my daily bread. Otherwise, I may have too much and disown you and say, 'Who is the Lord?' Or I may become poor and steal, and so dishonor the name of my God." I want nothing of this world that will tie me to it or make more difficult my daily struggle to surrender my heart to Him without reservation, without distraction. I want to be able to run through the eye of the needle!